When I saw this gory little b-movie back in the 80s on VHS, it was titled Return of the Alien’s Deadly Spawn, but the DVD release simply uses the original title The Deadly Spawn, which they apparently changed to cash in on rumors that there was going to be a sequel to Alien. 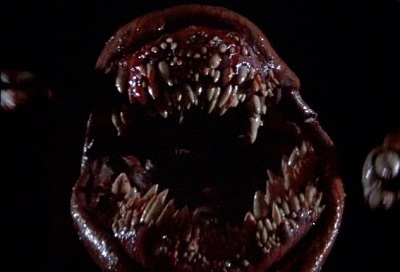 Somehow, Return of the Alien’s Deadly Spawn works so much better with the b-movie sci-fi/horror feel of this 80s treat that was originally released in 1983, one of my ten favorite years of the 80s. I can not believe how bloody red gory this film is, with plenty of awesome fake body parts (mostly heads) and the giant Deadly Spawn releasing slithering, sperm-with-teeth offspring (which love to eat head, ironically). The opening has two young guys camping out in the woods together (gay!) when they see a meteor fall to earth nearby. When one guy can’t find a flashlight in the tent, he starts calling out to the other guy…but instead of using a name, he’s calling out generic things like “Hey! Where’s the flashlight! Hello! Can you hear me? I can’t find the flashlight!” Apparently these guys are turning tricks with strangers in the woods! And those who are gay shall pay, so both dudes fall victim to the giant alien sperm machine. After some absolutely awesome synth-drenched creature feature music over the opening credits, we arrive at the house that is predominantly the setting for the remainder of the movie. It’s not explained, but somehow, the giant Deadly Spawn has worked its way into one of the dankest flooded basements I’ve ever seen. This thing looks like a sewer, and is apparently the perfect temperature to keep sperm-with-teeth thriving. In this house lives a boy with a room loaded with iconic horror merchandise (I can totally relate). You know who’s going to be the hero of this one. People keep ending up in the basement because there are electricity issues in the house. While the gore rules, the giant Deadly Spawn, revealed pretty much from the start, is sort of comical—like a more gruesome and evil Audrey II with great big eyes. But the real comedy is that no one has any idea of the horror in the basement (even though the cat tries to tip them off) and just go about their daily business. For pretty much the remainder of the film, we keep cutting back to the kid just standing in the basement taking in the Deadly Spawn feasting on the heads of anyone who ventures down there, while he’s being totally ignored by it. But the horror isn’t totally contained to the house. The sperm-with-teeth offspring escape the basement and head to a tea party. An old lady army strikes back, beating them down with umbrellas and other elderly apparel! These senior actresses totally get into it, crawling on the floor with sperm attached to them, blood gushing from their arthritic joints. Totally awesome. It wouldn’t be an 80s horror film if teen characters weren’t thrown in just to raise the body count. Let the killings begin as the Deadly Spawn manages to climb its way out of the basement to chase a bunch of them around the house! It’s so awesome to watch this three-headed moving monster model being pushed by hidden crew members—I’ll take that over CGI any day. In the aftermath of the carnage and the defeat of the Deadly Spawn, we get like five lame minutes of the authorities hunting down the remaining sperm-with-teeth through the woods, and it feels like an awesome flick has been ruined by a horrible ending. But what follows after the five minutes of filler is one of the most fricking unexpected endings you’ll ever see. If you thought twists began with The Sixth Sense, think again. This entry was posted in Living in the 80s - forever, Movie Times & Television Schedules - Staying Entertained, The Evil of the Thriller - Everything Horror and tagged 1980s, 80s, aliens, creature feature, Return of the Alien's Deadly Spawn, The Deadly Spawn. Bookmark the permalink.